The attacker knocked out two FIU @ Mast students with a tree limb. Police are looking for an attacker who beat two students at the FIU Biscayne Bay campus. NBC 6's Laura Rodriguez reports. Two students were hospitalized after they were brutally beaten by an attacker still on the loose at their school campus in Biscayne Bay. 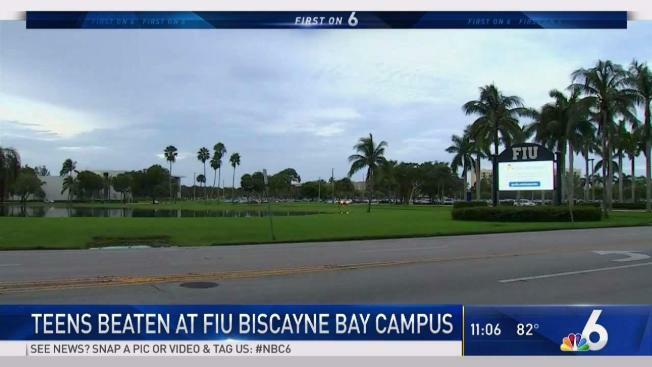 Sixteen-year-old James Critz and 15-year-old Isabela Perdomo, both students with MAST @ FIU, were working on a marine biology project on the Biscayne Bay campus early Monday when a male suspect approached them, their parents told NBC 6. The two said hi to the suspect, who returned seconds later with a large tree limb and knocked out Critz, and then Perdomo. He fled without taking anything. Both students have serious injuries and are recovering in the intensive care unit at Memorial Regional Hospital. Critz is sedated and intubated. Miami-Dade County Public Schools classes were not in session at the time of the attack, however, Critz and Perdomo were on the campus working on a project for a dual-enrollment class. The attacker has been described as only a black male, possibly between 16 to 18-years-old, and wearing a t-shirt and shorts, police said. Police are asking students to be vigilant and are offering parking services aides to accompany students, faculty and staff to their vehicles. Superintendent Alberto Carvalho tweeted his condolences for the victims Monday night, adding that FIU police will be providing extra security, and Miami-Dade schools crisis team will be on hand when students return to class on Tuesday. Anyone with information should contact FIU police at 305-348-2626 or in the event of an emergency 305-348-5911.